Origin: the Cedar of Lebanon grows in forests, in Lebanon; introduced by the Crusaders. Bernard de Jussieu brings a young plant of Lebanon, hidden in his hat, in 1734: this young plant attains 20 m today (maze of the Garden of Plants, in Paris). Atlas Cedar, Cedrus atlantica (to the right on the photo), is native to North Africa, with bluish needles (squalid green). According to some botanists, in a very distant past, this tree also lived in Europe naturally. Of all genus, it is the most hardy species and it can reproduce spontaneously from seeds. Whining cedar, natural, rare mutation, exploited by the botanists for its strange decorative aspect. In general, it develops on a plan, with two branches opposite which grow to the horizontal. That one of the arboretum of Chatenay-Malabry (6 km in the South of Paris) is exceptional, because it developed on all sides, covering 680 m². It was selected in 1895. Cedar of Cyprus, Cedrus brevifolia is native to Cyprus. Its needles are the shortest: 1-2 cm. Cedar of the Himalayas, Cedrus deodora (needles most 4-6 cm long; stems characteristic pendulous; often tipped up arrow; upright cones of 12 cm). Cedrus atlantica: zone 6 (it supports cold until -23 °C or -9 °F). Cedrus deodora and Cedrus libani: zone 7 (they support cold until -17 °C or 1° F). Height: 40 m in its origin habitat, but 20 m in culture. Form (insulated tree): the outline of the Cedar of Lebanon is particular (see picture below). Dark grey bark, which remains smooth and shining until the age of 25 years, to crack then in scales of small dimensions. Persistent foliage: needles are short (3 cm), prickly, in triangular cross-section, disposed in bundles on short stems. They can be confused with those of the Larch, but the branch which carries the needles of larch is wider and sharper. Fruits in upright cones of 10 cm. They flake away on place in 3 years, leaving only the vide central stem. First yellowish green, they become crimson turn purple in maturity. Form the crown extends in the elderly and the peak becomes flat (tabular) after a hundred years. more upright and straight than to the cedar of Lebanon, especially when It is young. Branches graduated, in arch shorter than to the cedar of Lebanon and ascending. Tradition: Mythology and symbolism of cedar are mainly related to the cedar of Lebanon. The Mesopotamians dedicating the cedar to the temples (superb panels in the Louvre Museum and the British Museum). Cedar protect humans against demons. Gilgamesh, hero of the mythical city of Ur (Mesopotamia) is illustrated in particular in the search of cedar (see extracts). The Egyptians also used for the doors of the temples (expeditions sponsored by the Egyptian Queen Hatshepsut, which are detailed in bas-reliefs at the temple of Deir el-Bahari). It was also used in embalming rituals to purify and make immortal soul of the dead. In the Bible it is said that the cedar was used for scaffolding, but also as a purifier tree. The Cross of Christ was made in Cedar, for the cross and olive wood for the stake. The Qur'an cites Sidrat al-Muntaha, cedar or the end: "This giant tree rises to the seventh to under the throne of Allah, when a leaf falls, someone dies. " In Celtic astrology, the cedar represents confidence. 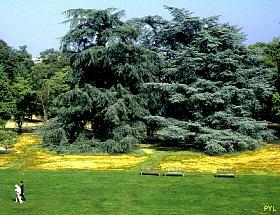 The Cedar is the emblem of Lebanon. The Cedar of Lebanon was planted in parks and arboretums in Europe, before being dethroned by the Atlas Cedar (in 1860s, it was used to reafforest the massifs of Lubéron and of Ventoux, where climate resembles that of North Africa). - Medicinal: plant astringent, diuretic, antiseptic, antifungal and diaphoretic (wood, resin). - Perfumery and incense essential oil (wood, leaves). - Wood heating, carpentry, woodworking, shipbuilding, cabinetry, ceiling panels and carved by wood quality.